British singer Morrissey was hospitalized overnight after reportedly collapsing on stage during a concert, medical officials said Sunday. 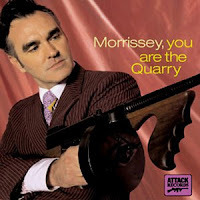 Morrissey was discharged about 1 p.m. (9 a.m. ET) on Sunday, "much improved," said Great Western Hospital manager Teresa Harding. "He was admitted ... as a precautionary measure," she said, refusing to reveal anything further about his condition or the reason he was hospitalized. The 50-year-old recording artist — full name Steven Patrick Morrissey — was scheduled to perform in Swindon, west of London, on Saturday night. According to fan accounts on various websites, the singer collapsed after the first song. "Morrissey is in stable condition after his collapse in Swindon Saturday night," said a statement on his website. "Thanks go out to all his well wishers, more information will be posted as soon as it is available." Best wishes to the alt rocker, and I hope you feel better soon!